The shares of 230 companies and 4 mutual funds listed on the Ho Chi Minh Stock Exchange edged back down on May 21, after one day of gains, as investors responded to the bearish trend. Vietnam’s benchmark VN-Index tumbled 3.94 percent, or 19.86 points, to close at 483.69, the lowest level since February 9 of this year. Turnover improved to around 61 million shares worth VND2 trillion. Only six shares advanced among the members of the city bourse, 220 dropped and 8 remaining unchanged since yesterday. Wire producer Ngo Han Joint Stock Company (NHW) in Dong Nai Province, the Hanoi-based Post and Telecommunications Investment and Construction Joint Stock Company (PTC), and Quang Ninh Province’s Royal International Corporation (RIC), led declines in the southern market. Saigon Securities Inc. (SSI) retook the top position of the most active shares in volume with 4.89 million shares traded on the city bourse, followed by Saigon Thuong Tin Commercial Bank or Sacombank (STB) with 2.39 million shares changing hands. Ho Chi Minh City Infrastructure Investment Joint Stock Company (CII) came next with 1.82 million shares. The company’s shares traded down 4.94 percent to VND38,500. The Danang-based Vietnam Electricity Construction Joint Stock Corporation (VNE) rose 4.97 percent to trade at VND16,900. Telecommunication cables producer Viet - Han Corporation (VHG) gained 4.82 percent to VND17,400. Descon Construction Corporation (DCC) saw its share value rise 0.36 percent. The smaller bourse in the north also stayed in the red as the Hanoi’s HNX-Index finished at 152.69, down 6.53 percent, or 10.67 points. Trading volume was at 43.4 million shares worth VND1.22 trillion. 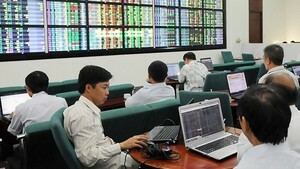 The index of the over-the-counter market, the UPCoM-Index, experienced a slide of 2.22 points to 48.26. 219,967 shares changed hands, totaling VND3.22 billion. On the global market, Wall Street experienced the worst decline since the beginning of this year, as most major market indexes in the US fell amid concern over the sluggish rate of economic recovery. The Dow Jones industrial average lost 376.36 points, or 3.6 percent, while the Nasdaq composite index fell 4.1 percent.